Unless you've been living under a proverbial rock, you'll know that BB creams are all the rage in the beauty world at the moment. And of course, I am a band-wagon-jumper-on-er and have been studying reviews of the various offerings out there at the moment. Nothing had really tickled my pickle so far and when wandering through Boots a few weeks ago, I noticed L'oreal's offering to the BB genre. I had a quick swatch and was immediately intrigued but at €16.99, not that intrigued. The following week I was in my local chemist who had it on offer at €10.75 and that was obviously a sign for me to get it. So voila! Described as a "bare skin beautifier" and promising to mimic "the texture and glow of perfect bare skin", I got stuck in. I've been looking after my skin lately and feel confident enough to try something that'll make me look like I've perfect skin without having product caked on. The cream itself is a pale grey in colour and really runny. In person you can see the little smart pigmentation capsules that correct tone, cover imperfection and refine skin texture. 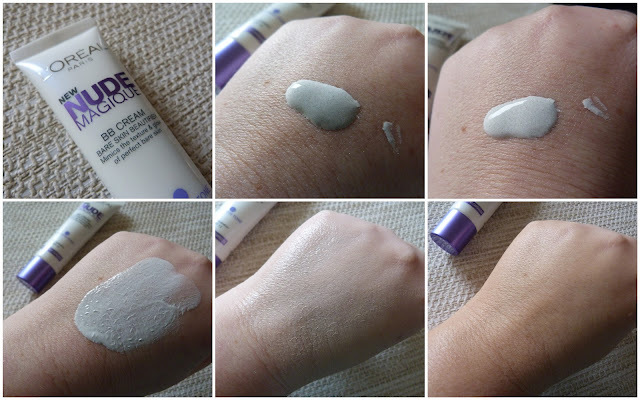 When you apply it to your face and start rubbing it in, the cream turns from a pale grey to an even paler grey, finally turning into the colour of your skin, or in my case, slightly darker but not too dark. Phew. It has no scent and feels nice and light on the skin. It promises 24 hour hydration and has SPF 12 in it. It blends easily into my skin and really does feel like I've nothing on my face. I usually use brushes to apply foundations but I use my fingers to really work the product into the skin as the Pixiwoos would say. It evens out my skin tone, making it look like I have nicer skin naturally. 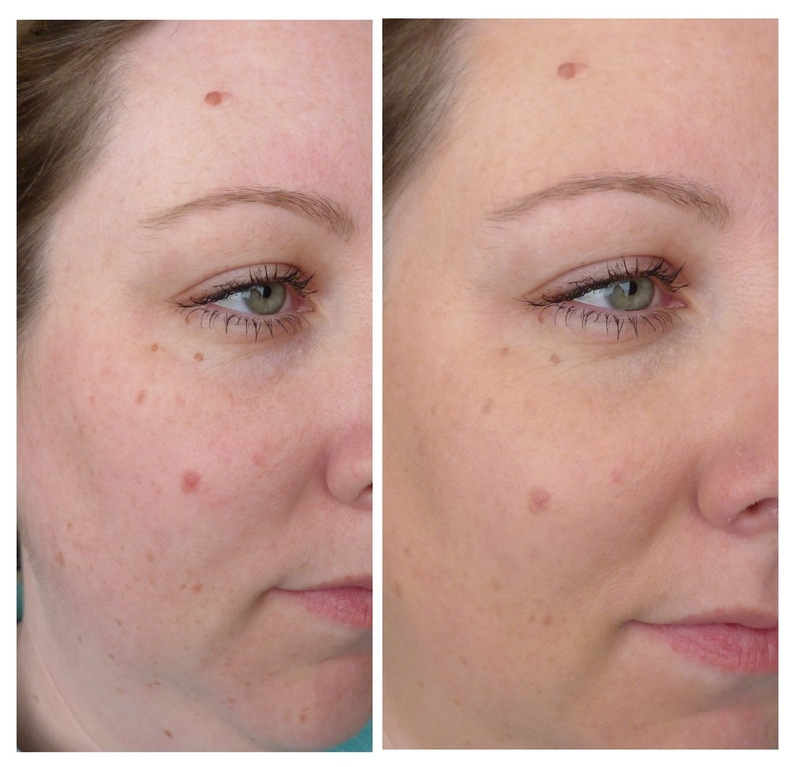 You can see in the before and after photo below that it covers a lot of my pigmentation marks (something I'll be hoping to get rid of soon with the aid of some new products I'm testing out). My skin still shows through, it just looks better! I haven't worn it for 24 hours to test out the hydration promise, but after 9 hours of wearing it, my skin doesn't feel tight or uncomfortable. After about 5 hours, I feel that I do need to top up with powder but I would need that usually with my regular foundations. I think you need to be confident with your skin to wear this cream and I would happily purchase this again, for €10.75, not €16.99. I'm going to make Joanne try this out too, she has dry skin and doesn't wear foundation on a daily basis. I have oily/combination skin and usually slap on as much make up as will fit on my face! So it'll be good to see how she gets on with it. Have you tried this ladies? Any other BB creams you're loving at the moment? Yeah, it's a grand product when you're having a good skin day and just want a better one! That's actually does a really nice job mite give it a go but I agree not for 16.99 I'll see what price superdrug has it for. Gret review, thank you for sharing! Cool post, i really like your blog and found it from a comment you left on a another blog. Would you like to follow each other? I've been looking for someone to convince me to try this. I tried it in Boots and loved it, but the price is steep for such a small tube. I might use my point though and pick one up! interesting. That's not released here in the phils. Does this product cover up redness and blushing? Seems like the coverage for this is quite sheer, not much works on concealing. Am still loving my Skin79 bb cream. Thanks for sharing! i'm not saying this to be mean.. is this picture photoshopped? it looks like both pictures are the same, the facial expression and the reflection in the eye (minus the skin completion and the framing of the picture) i'm just wondering because I'm debating on whether to buy this product or not. and btw your skin looks absolutely stunning in both pictures! Heya, no it's 100% not photoshopped! I don't edit or manipulate my photos in any way, I have it down to a fine art now, holding the camera in the same way and looking at the same point in my bathroom! First of all, thank you for your reviews. I've seen you've reviewed 2 products I'm having doubts which one should I buy. I have oily/combination skin. But it is pretty oily, I must emphasize. Please, could you compare, would it be more worth to buy L'oreal or La Roche Posay. I know L'oreal is a drugstore product, and LRP can be only bought at the local pharmacist (at least in my country). But I am not satisfied with LRP foundation (fluid, "toleriane") as, with the day passing, my skin starts to super-shine and the foundation "leaks". I've used Garnier BB fro oily skin but the color doesn't mach my skin tone too nice :).